This is a post mortem about my experience running the 5th edition D&D module Tomb of Annihilation. If you’re a player who may experience this as a campaign, don’t read this post, since it will contain spoilers for the module. If you are a DM who is considering running the module, you might find this post useful. If you have no interest in running or playing the module, you might still find it interesting, though not entirely comprehensible. If you’re one of my players, this is safe to read as this doesn’t contain any spoilers for anything you haven’t seen yet. It may also shed some light on things that might have been confusing during play. If you’ve already played or ran the module, this is (probably) also safe to read, and I’m interested in hearing your thoughts about how you did things differently or whether you think my critiques are off base or not. First, some background: I ran the ToA with an advance copy provided by Wizards of the Coast. I had a slight head start on some players in running and prepping this, though it was officially released a few months after our campaign started live streaming it. My players are mixed: some very experienced, some only somewhat experienced. A couple have been playing D&D for a very long time. I have one player who playing in his first campaign, and another who is playing 5e for the first time but has previously played 3.5. Fifth Edition has proven to be a great D&D edition for me and my group. Let me preface that by saying I was quite fond of 4th ed and did not like 3.5 very much. That puts me in a minority. A minority of very smart people with excellent taste, mind you, but a minority nonetheless, so when you read this, you might want to keep my tastes in mind. Have a Super Mar 10! For Mario March I am creating Mario-inspired food and drink. I’m going to be playing Braid today. 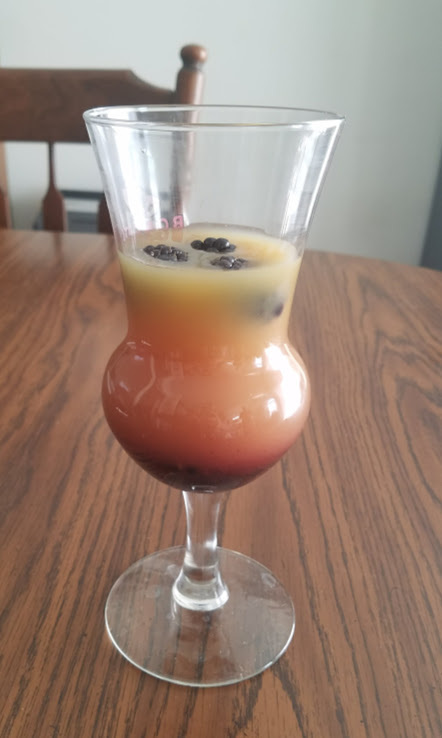 In the spirit of The Drunken Moogle, I thought it would be nice to create a cocktail to celebrate this game, and drink while I play. Some game and geek cocktails only mimic the aesthetics of the thing they are trying to tribute. But I am determined that my Braid cocktail should capture not only some of the game’s painterly look, but also the spirit of Braid, pun intended. Obviously, the first alcoholic beverage that comes to mind is a bottle of wine, spilled on your dinner date. But what aside from that? Braid is a meditation on the concept of regret. Once you consider that, the choice of spirit is clear: there is no spirit that you regret more than tequila. Specifically, I regret the tequila sunrises that I had in Cancun, but that may be on a more personal note. I don’t want to just recreate a Tequila Sunrise, so let me instead present my Braid inspired version, which I call Tequila Sunset Over Tim’s House. 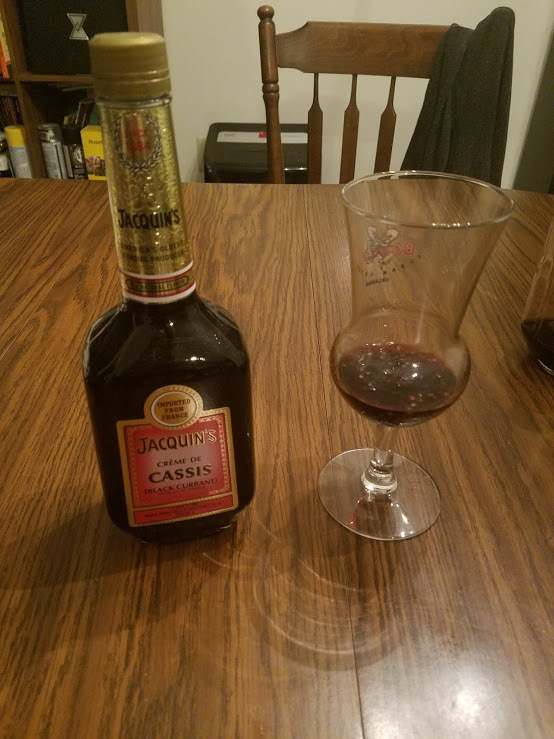 Mix this dark and foreboding liquid gently, then pour it into your chosen cocktail glass. 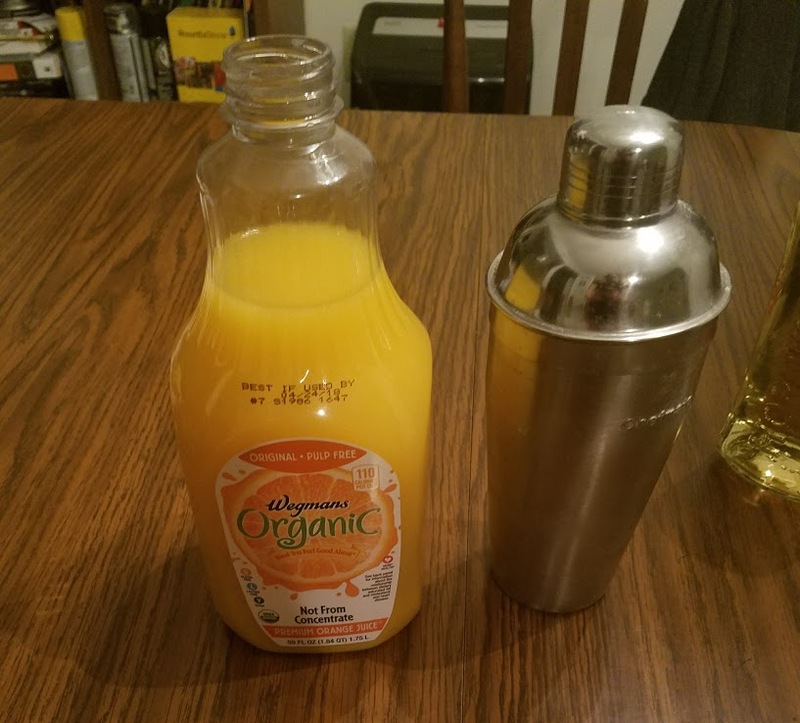 Fill a cocktail shaker with ice, add the orange juice and the rest of the tequila. Shake. Using the back of a spoon if you need it, layer the orange juice mixture over top of the berry mixture. Create an ominous fiery sunset over a dark city, like the starting screen of Braid. Add a few more blackberries to float on top to symbolize dark clouds looming on the horizon. Have you been watching my Twitch stream? This is a really good place to find me lately, since I’m trying to get into a habit of streaming more often. I’ve gotten involved with an awesome group of streamers all locally in Philadelphia, and it’s a blast playing games and hanging out. This month there’s a vibe going on that Elliface started, and that’s Mario March, where many of us in the community are playing Mario games all month. However, because I’m an Indie Hipster, I’m not going to play many actual Mario games. 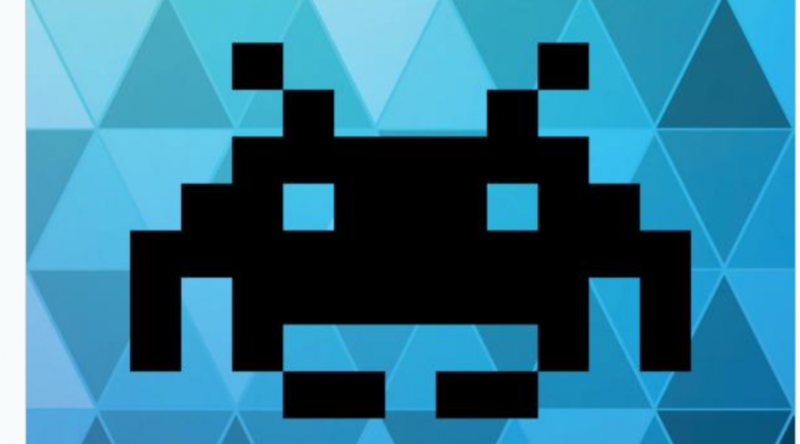 Instead, I’m going to also play Mario-like games that are made by independent developers. I’m also going to stop by the Cooking with Heat stream to cook some Mario-inspired food. Woot! 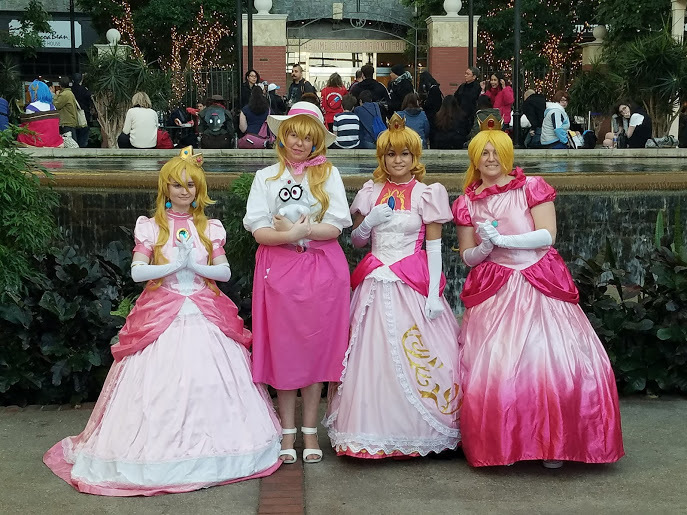 I might even wear my Princess Peach cosplay…. 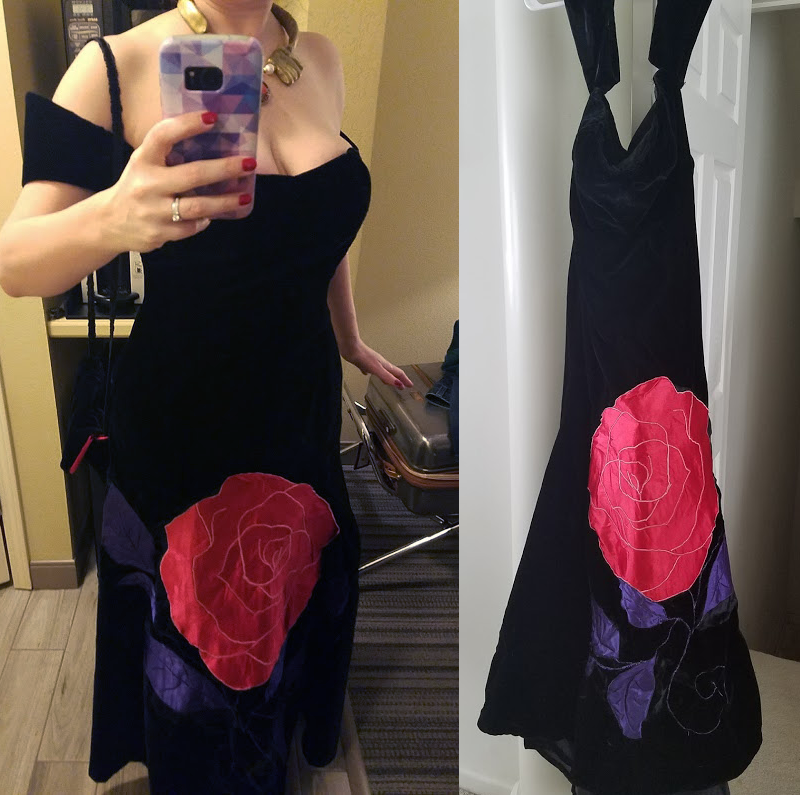 which I wore to PAX and MAGfest. I met a swell bunch of Princesses there. Look our community up for the fun! 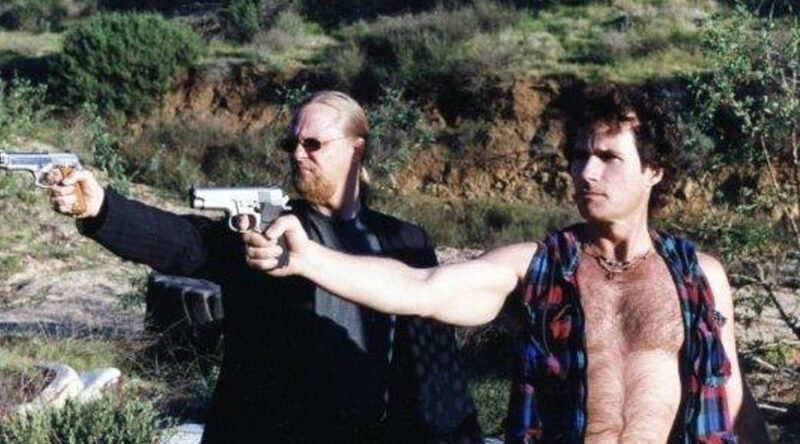 There’s a B movie I’m really fond of called Guns of El Chupacabra. If you’ve hung out with me and my husband for long enough, you’re probably familiar with the movie. 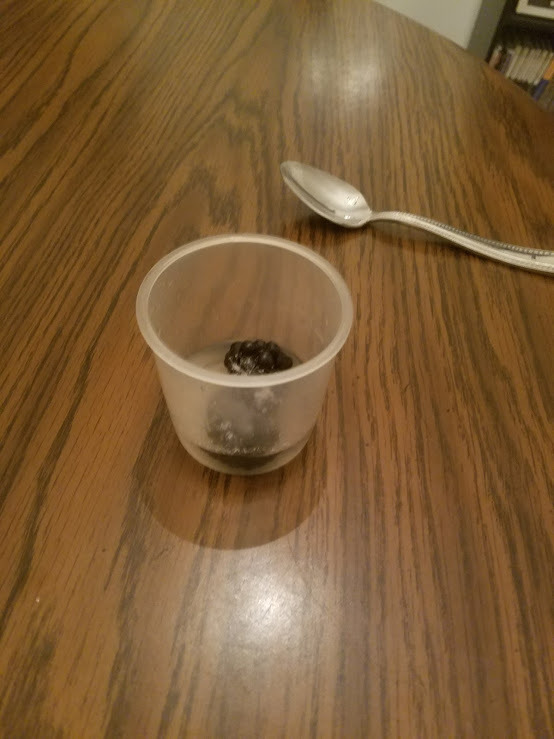 We discovered it through the Smithee Awards ceremony at Origins Gaming Convention, and have been sharing it with people for years. The hero of the film is played by Scott Shaw, who is also the director of the film. The heavy in the film is the late and great Robert Z’dar. As far as I am aware, we own the only DVD copy of the film signed personally by Robert Z’Dar, and I treasure it. I’d explain the plot, but it’s not very coherent. It has the elements that you’d expect: guns, El Chupacabra. There’s a scene near the front of the film where our hero, Jack B. Quick, is buying the titular guns. He visits a gunsmith that operates out of the back of a truck. The gunsmith explains the variety of different weapon he offers, doing demonstrations that explains the merits of each individual piece. This is a standard scene in an action film, the hero gearing up sequence. But because it’s a movie filmed without a real script the smith just rambles and it goes on for way too long. This is an accidentally brilliant line and I think about it a lot. I wanted to do a “canon” gown from the Sailor Moon manga, show, or art. 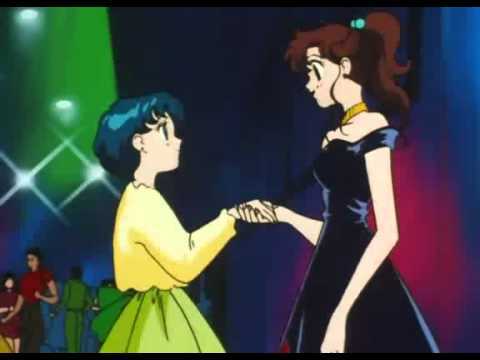 My favorite character is Makoto, or Sailor Jupiter, and I have cosplayed her before in her regular Sailor Senshi outfit. (You might think that a geek girl who likes computers would be all about Sailor Mercury. I do like her, but Sailor Jupiter is the awkward girl who is a hard kung fu badass on the outside, but a sweet romantic on the inside. Plus she loves to cook! So I love her to bits.) I knew I wanted to do something Jupiter-inspired. 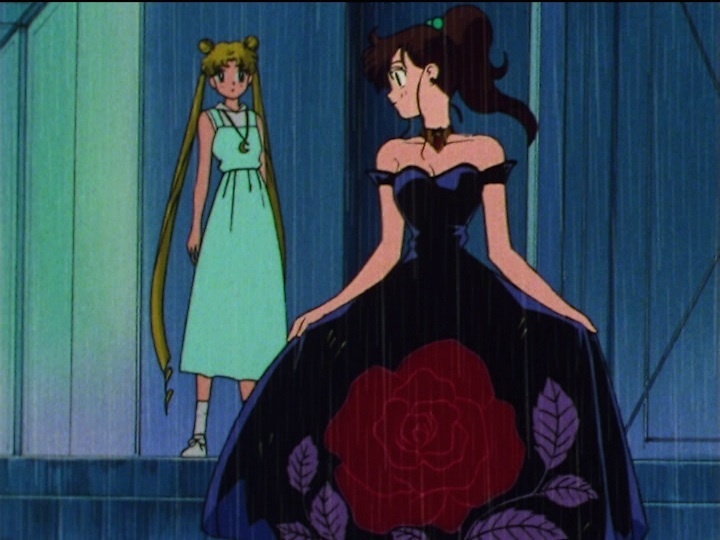 After examining my options, I thought about doing the green gown… but, I polled my friends, and we had never seen anyone attempt Makoto’s black gown, which Jupiter wears in the Sailor Moon Super S series. The episode is actually about a date going pretty badly for Makoto, but… I figured for a real date, it would be pretty charming. Plus, I’m kind of into the whole “girl falls for the villain” thing anyway. Sorry, not-sorry. So I made up my mind to create this dress. For the last year and change, I’ve been taking sewing lessons at the JoAnn Fabrics in Downingtown. I must give my thanks for this to the incredible Denise, who is the instructor there who helps with the “Sew What” classes. She will allow someone to bring in basically any project and she’ll give guidance on how to make the outfit come to life. She is a big help with teenage cosplayers and helped me make my first from-scratch cosplays, as well as this gown! Whenever I’m ready to create a new cosplay, the first thing I do is pin a bunch of views to my Pinterest. In this case, screenshots of the dress available on-line, and a very nice rendition done on DeviantArt, were my main clear references for the costume. 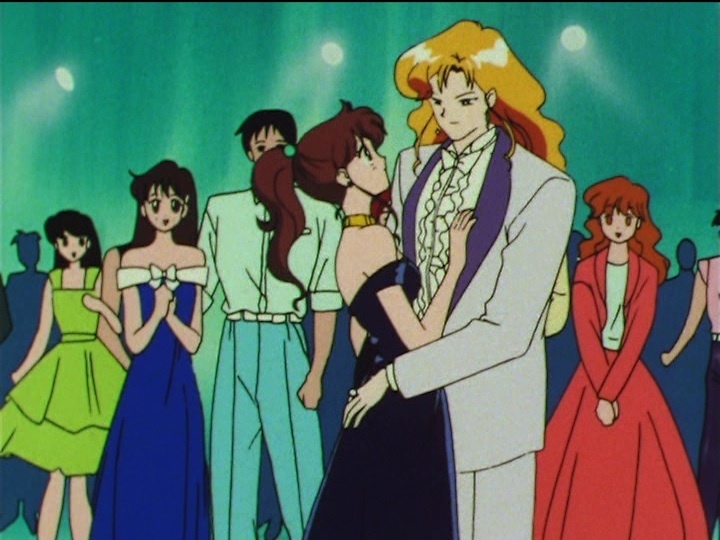 Looking at the pictures of the dress in the anime, I thought black velvet would be the most dramatic for the real dress. After looking at the options available at hand, I picked the pattern McCalls M7320, View C, to make this dress. It has a slightly longer train than the ‘canon’ dress, but I liked the effect of this. Changing the skirt bottom would be simple enough though if you wanted a shorter train on the gown. The dress does have some seams up the front. Sewing these on didn’t interfere much with the design and gave the dress some much-needed structure and fitting help. I made just a couple of small changes: one, I sewed some bra cups into the top of the dress to help out with some support, and, two, I had to create and sew on the little off the shoulder straps on either side. Other than that, the dress itself was pretty much the same as in the pattern! The biggest challenge of this was the rose applique. To plan it, I took the art of the rose, and shifted it to grayscale, then blew it up in Photoshop. It took some trial and error to get the rose the right size. Once I had the size I liked, I printed it out on multiple pieces of paper which I taped together. I used 2/3 of a yard of red satin, and 2/3 yard of light purple satin. I had quite a bit of purple left over, but I was okay with that since it did give me some chance to make mistakes. You could probably get away with a bit less if you placed leaves carefully before cutting out. 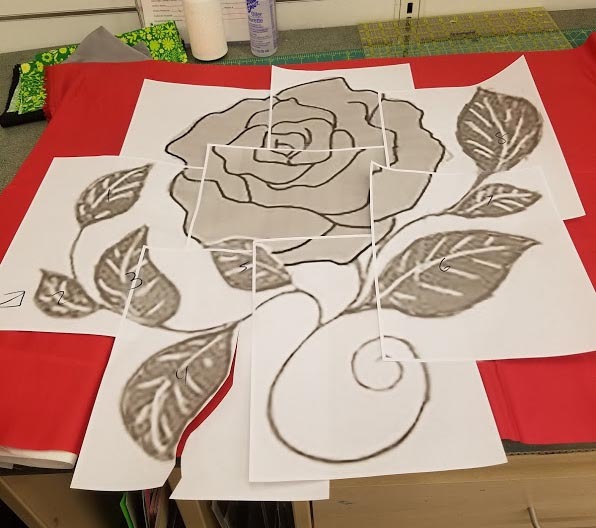 Since getting the size of the rose right was a challenge, I’ll provide my final pattern for if you want to try it yourself. (Link to it in my public OneDrive.) I laid all the pieces out on to the fabric, and cut out interfacing in the same shape as the pieces. I used 805 weight fusible interfacing to back the satin. The first step is to iron the interfacing on the “wrong” side of the fabric, then cut the shape as precisely as you can. Finally, peel the paper back of the interfacing off. The interfacing will add stiffness to the fabric so it won’t lose its shape during the embroidery process. And it’s fusible on both sides as well for placement. For embroidery, I had three colors of thread: pink for the rose petals, dark purple for the leaves, and a light purple embroidery thread to match the light purple on the leaves, which was used for the stems. Using my printout as a guide, I first lined up the flower shape where I wanted it, and ironed it onto the velvet fabric (carefully, since velvet is easy to wreck with too much heat). After that, I used tailor’s chalk to trace on the patterns of the petals. Then I used my sewing machine on an embroidery stitch, and carefully followed the lines that I drew! This was time consuming, and I didn’t get it exactly perfect, but I was pretty happy with the way it turned out. 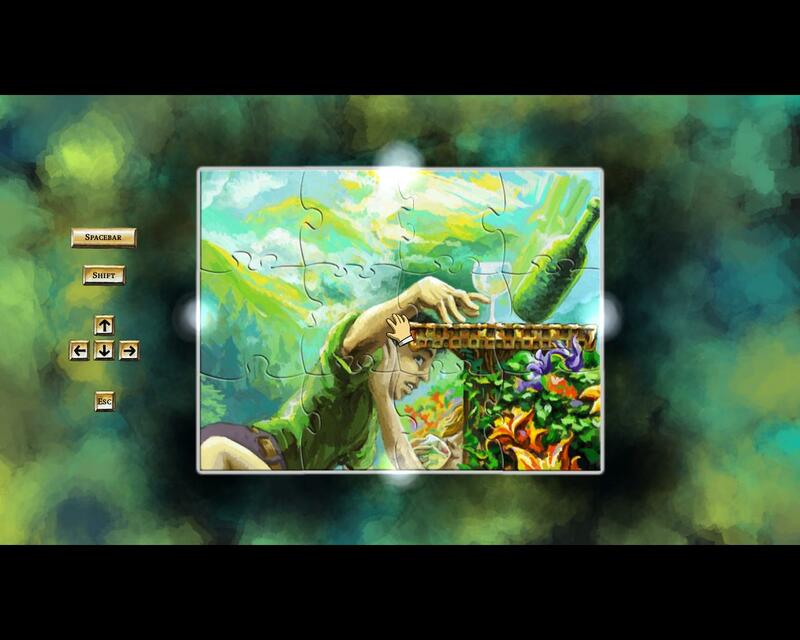 From there, I started first with the leaf that overlaps the rose, since its placement was most critical. Again, I ironed it on first, then sewed it on, this time with the dark purple thread. Then I used my template to carefully lay out all the remaining leaves and sew each one in place. To make the stems, I put a paper backing under the dress, and again traced the lines I needed onto the dress with chalk. I mostly did this freehand, using the template and eyeballing the right placement for the swirl at the bottom, as well as connecting all the leaves and the rose itself. The paper backing peels off when sewing is complete. And the pattern was done! To make the shoulder straps, we measured around the shoulders, and cut four strips of velvet with a “peak” on each one. I sewed stiff interfacing onto the inside of all four strips to make sure the sleeve pieces had enough body to stand up on their own. They don’t add any structure to the dress and just sort of hang there. But they look nice! I’d say the one thing I ended up disliking about wearing the dress is that, even with added bra cups, it didn’t really give me much support up top. Upping my corset and bodice construction game is one skill I definitely want to work on this year in crafting. But the next time I make a ballgown, I’ll go for one that I can wear a regular bra under, for comfort reasons. My next dress is probably going to be Princess Peach! I do have one other regret, which is that I was in the restroom when they did the “every Sailor Jupiter” group photo, and I totally missed out on it. Ugh! But there’s some photos of the ball on my Instagram. I have some professional photos coming of our final look at the ball, but in the mean time, here’s a couple snaps of the finished dress. Good luck if you try to make it yourself or something like it!